Samsung Electronics Co., Asia's largest maker of mobile phones and memory chips, said Monday that it has recently decided to withdraw from the electronic paper (e-paper) business due to cost issues. The company, however, will not completely leave the market for electronic book (e-book) readers, and plans to launch next year an electronic reading device using a liquid crystal display (LCD) panel as a screen, according to the company's spokesman. "We will launch a new e-book reader next year but it will use an LCD instead of e-paper," said spokesman Kim Se-hoon by phone, refusing to say when the company halted e-paper production. He also declined to elaborate further on the size or other specifications of the forthcoming model. Wow. One of the heavyweights just dropped out of the market. 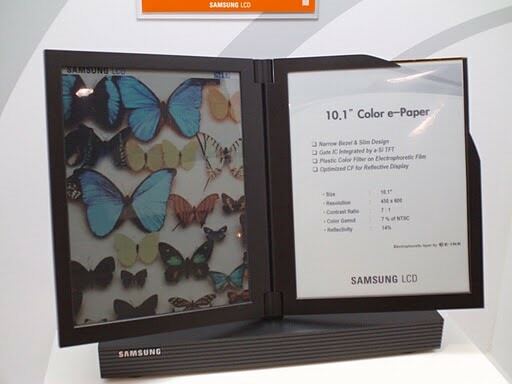 Samsung were an exhibitor at SID Display week, a screen tech trade show. They weren't just making devices; they were doing original research on new screen technology. TDR covered SID Display Week back in late May early June. Now I'm really glad we did. We probably won't have a chance to see their screen tech again.